Many people have memories of four-o’clocks in their family garden. These beautiful flowers have been popular plants for generations. Four-o’clocks (Mirabilas jalapa) self seed. Often you can find them still growing in a long-abandoned garden spot. It’s an old Southern tradition to plant them near the front door. These jasmine-scented flowers will greet your guests. 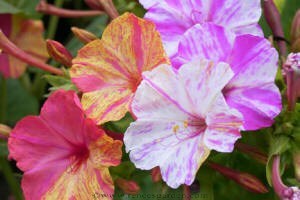 In South America, where these flowers originated, four-o’clocks are used as a dye. The root is used medicinally and is said to be a hallucinogen. In herbal medicine, parts of the plant may be used for diuretic, purgative or vulnerary (wound-healing) purposes. I can’t speak for any of these herbal or medicinal uses—I have only enjoyed the flowers and their fragrance. I’ve also read that the flowers are used in food coloring. The leaves may be cooked and eaten as well, but only as an emergency food. An edible crimson dye is obtained from the flowers to color cakes and jellies. Four-o’clocks are also also known as the ‘Marvel of Peru’. Four-o’clock ‘Broken Colors’ are a special variety with starry, 2-inch blossoms that are beautifully splashed with showy, contrasting colors. Their delicio us jasmine fragrance floats on summer breezes. These flowers are both easy to grow and reliable. You can find the seeds on Renee’s Garden’s website for $2.79 a packet. Before planting, soak the seeds in water overnight to speed the sprouting. These flowers are trouble-free, love full sun and have only moderate watering requirements. Your four-o’clock flowers probably won’t bloom at exactly 4 p.m. Mine bloom at about 6 o’clock. The blooming time depends on your time zone and the plants’ exposure, but whenever it blooms it will stay consistent. You can count on your flowers to bloom at the same time every day. However, if it is cloudy or rainy, it may throw their solar clock askew. This entry was posted in Herb Everything, Herbs in the garden, My Gardens, My Homeplace, Oh Grow Up!, Ozarks Travel Examiner and tagged Broken Color, Four-o'clocks, Garden Giveaway, Giveaway, Old Favorites, Patsy Bell Hobson, Renees Garden, Tips. Bookmark the permalink. I planted some of these from Renee’s Garden last year; they were so pretty! Sad to say, none of them came back this year, and I forgot to order more this year. My mother always grew four-o’clocks, and I can remember picking the seeds as a child.